If you’re wanting to see Goa beyond its beaches, parties and low-priced alcohol, then you should take a tour to Fontainhas, the colourful and culture rich Latin quarter of Goa. I’m a sucker for history and Fontainhas was such a rare find in Goa. The colourful bylanes of this oldest Latin quarter stores immense history within its walls. Located in Panjim, Fontainhas is flanked by an ancient creek called Ourem Creek to the east and the Altinho hills to the west. The place gets its name from Fonte Phoenix (the Fountain of Phoenix) spring at the foot of the hill. Fontainhas was declared a UNESCO Heritage Zone in 1984. A walk through this old Latin quarter feels like a journey through a postcard of a pretty street in a European city. The winding alleyways are in spectacular shades of blues and reds. The houses, some dilapidated, others standing solid, untouched by the onslaught of time, brings alive Goa’s Portuguese past. The colourful lanes, quaint shops, bakeries, art galleries and restaurants give it an undeniable character. Walking through the streets of Fontainhas gave me a nostalgic feel of the French quarters of my hometown Pondicherry. 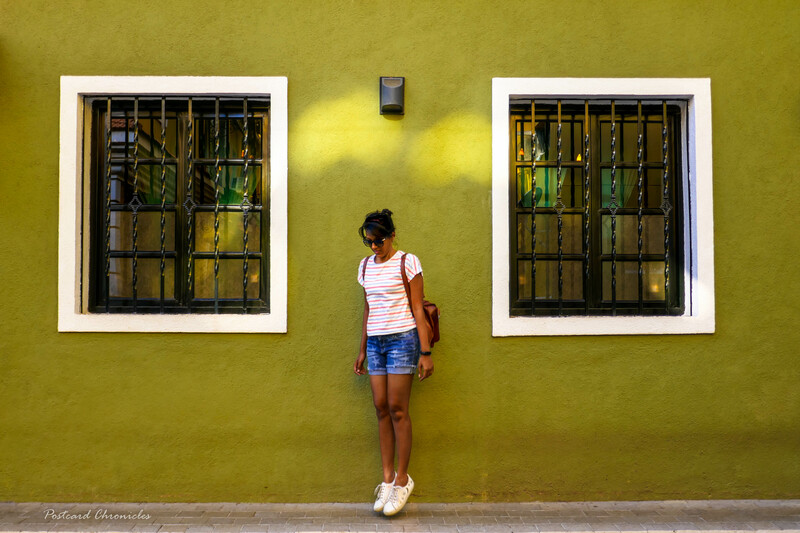 The lanes of Fontainhas perfectly captures the old world charm of Goa. The lifestyle of the place is something every urbanite craves for. How this gorgeous tiny town was urbanised? Hindus, Muslims, and Portuguese, colonised Goa, while the latter leaving the biggest influence here, by far, which is clearly evident in Fontainhas. A wealthy Portuguese man, Antonio Joao de Sequeira founded Fontainhas in the late 18th century. He used this land for coconut plantations. As a result of an epidemic in the Old Goa, the Portuguese government headquarters shifted to Panjim in the early 1800. As a result, this area was transformed into a residential area for Portuguese administrative officers and rulers. Soon, small plots in Fontainhas were sold to the populace without any appropriate town plans. This is why, you can see narrow lanes connecting one tapered street to another that only a local can show you. You might come across a couple of street food carts in Fontainhas serving beef samosas and prawn cutlets which is a must try. There are details in Fontainhas that you can’t miss. It is very easy to identify the Portuguese houses. All Portuguese houses have a bright coloured rooster on the top. Rooster is a national symbol of Portugal which symbolises honesty, integrity, trust and honour. Every Portuguese family has this on top of their houses to bring them good luck. The streets have very curious names and the backstory is very interesting as well. Rua 31 de Janeira (31st January Road) relates to the date of Portugal’s independence from Spain. Bustling 18th June Road, relates to the date in 1946. Fontainhas is best explored on foot, and strolling among its narrow cobbled streets will definitely transport you back in time. Painted in hues of green, pale yellow, pink and blue, along with tiled roofs, artistic doors, and overhead balconies, you’ll instantly fall head over heels with the rows of Portuguese houses that cover the landscape. Portuguese houses in Fontainhas are painted fresh every year after the monsoons. It’s a rule that was laid out by the Portuguese, which is followed even today. One of the Fontainhas most beautiful and emblematic attractions which is especially notable for its pristine white exterior, is Chapel of St. Sebastian. Stepping inside, you’ll find three resplendent altarpieces, a crucifix, and a statue of the Virgin Mary. There’s a unique thing about the crucifix housed here—the figure of Christ on it has eyes wide open. Climb Altinho hill to visit the attractive tangerine-colored Maruti Hindu temple. It is a temple of Lord Hanuman. The view from the top of the hill is mesmerising. Gitanjali Gallery is a hub for all the art fanatics. I absolutely enjoyed my time in the gallery. You can find this place next to the heritage hotel, Panjim Inn. The gallery houses contemporary art as well as a vast collection of Scandinavian art from the 1950s to ’90s, including linocuts, etchings, lithographs, woodcuts, and serigraphs. While work by local and international artists fills the space, it also hosts poetry and book readings, art and theatre workshops, book launches, and courses on art, history, and film appreciation. There’s a café on-site, so you can warm up with an espresso as you browse the collection. I walked half a km more to end my heritage walk at the Our Lady of Immaculate Conception Church in Panjim. This bright white painted church stood tall with zig-zag stairs adding charm to the entire structure. The lively, award-winning Viva Panjim on on 31st January Road serves yummy Portuguese and Goan cuisine. On the same street, Hotel Venite, with its art graffiti walls, has an unforgettable ambiance with yummy food. It’s popular with locals and travelers. Further down the area, in Miramar you’ll find Mum’s Kitchen, the restaurant strives to preserve Goan culture by curating food from recipes given by Goan mothers. Overlooking the river on Rua de Ourem, Horse Shoe is renowned for its authentic Portuguese cuisine. It’s evocatively located in a lovely 300 year old house. A couple of minutes walk away, on Gomes Pereira Road, Joseph Bar is an old local establishment that’s been recently restored to its former grandeur. This intimate and hip hangout is only open in the evenings from 6-10 p.m. Try the feni cocktail. Talking about feni, get your hands on Cazulo’s dukshiri Feni, a favourful twist to the range of Feni’s available in Goa. Next-time when you’re in Goa, take a walking tour of Fontainhas to experience a culture rich Goa. I should thank Goa Toursim Board for showing me these hidden gems in the city. PS: This post is in collaboration with Goa Tourism Board and all opinions are mine.